Sometimes a horse’s form—that is, its use of its legs, back, and neck—may be attractive, but the animal commits other errors over the fence by wavering from the ideal flight pattern. The flight pattern of a horse begins as the animal leaves the ground on the near side of the obstacle and ends as the horse’s feet touch the ground on the far side. Ideally, the horse’s landing spot and its takeoff spot should be equidistant from the center of the fence. To simplify the explanation, if a horse leaves the ground 6 feet from the center of the fence, it should land on the far side 6 feet from the center of the fence. In addition, the horse should approach the middle of a fence without wandering off of a straight line, jump the fence without drifting off that line in the air, and land on the same line. On hunter courses, a horse that deviates from this ideal path commits a flight pattern fault. 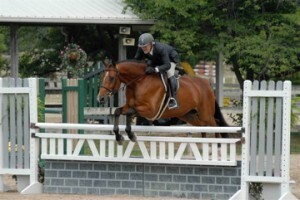 The excep­tion is usually a handy hunter class, in which the placement of a previous or upcoming fence may require the horse to jump the current fence at an angle or at some place other than the middle of the fence. This horse has a good flight pattern as it jumps across the middle of the fence. 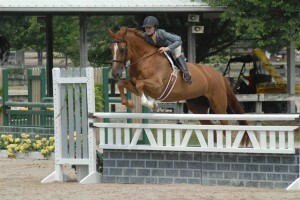 This horse has moved away from the center of the fence in a flight-pattern fault known as "drifting."